Want to manage your time better, get work-life balance, succeed at your job or get a better one? Slice the Salami gets you there with quick and clear bite-sized chapters. This book will help you in your life and your work, and even help you separate the two. Learn practical tips to save you time, enhance the joys in your life, and maybe even get you one or more promotions at work from practical tips that you can digest as easily as your favorite sandwich. Artie Lynnworth is passionate about his career, hobbies and interests, and brings this intensity and perspective to you in this guide for life and leadership. He wants you to succeed, and he shows you how! This practical book shows how big changes, seemingly-overwhelming changes that we may need to make in response to problems, can be reduced to manageable small steps. Small steps are simple and easy, reducing a big task to small achievable tasks completed one slice at a time. Encouraged by the book's easy-to-apply philosophy, I have already made progress with de-cluttering papers to be filed or shredded, removing weeds , & donating personal items. This book reads like the author is talking to me & understands my problems. I've already applied its solutions to existing problems and to new ones. 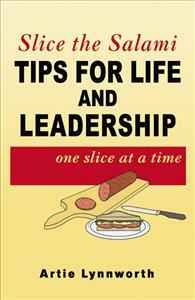 "Slice the Salami" is a "must-read" for folks at every crossroad of career, educational and family development! I bought copies for all of my children, and they seem to be embracing Artie's philosophies, suggestions, examples from his many and varied experiences, even though they are all currently engaged in successful careers. "You never stop growing and learning as you move forward" in life. This book clearly tells you how to do that positively with proven success. I enjoyed digesting each chapter in this easy-to-read book, and particularly like the short reviews of each chapter at the end....great for finding specific guidelines quickly when needed! This book should be a mandated "read" in every university in the country!! This is truly where "the rubber meets the road!" I had the fortune of a two-hour phone conversation with Artie Lynnworth, a man who has trained interviewers, the night before a medical school interview. We discussed an interviewer's point of view and goals, the components of an interview, how to present your qualities efficiently and effectively when answering questions, and even how to apply these techniques elsewhere, such as résumés. I prepared using the tasks he gave me. The next day, using Artie’s methods, I rocked both the interview AND the group sessions, even though I'm normally shy! I received an acceptance (no waiting list!) at the most competitive time in the admissions cycle, the very end, fighting for the last few seats. In fact, Artie's techniques gave me so much confidence that I declined, applied again, and now attend the right medical school for ME. Reading “Slice the Salami,” I found everything Artie taught me, explained well in greater detail. He says “the best predictor of future performance is past behavior” – and I know from experience how well this book will serve me when I compete for residencies. If you buy this book just for interviews, you will do great. If you learn the life skills it contains, you will gain fantastic examples of your performance to offer at each new interview in your future career. As a former teacher/coach and business owner I wish I had this book available to me years ago. Now, as a retired person, I have a great gift to pass along to my former student/athletes and bussiness associates. Gosh! How I would have appreciated having this fine book when I was applying for my first full-time job years ago. I knew so little! I was so unprepared! Or when I jumped up to a better job. Then when I moved to another in a different field. Certainly when I started my own business. And when I finally sold it in preparation for retirement. And in my personal life as well. In structuring my time more effectively. Re-ordering my priorities. Establishing the best balance between work and family. The book would have been useful often. In building my career, it would have given me essential training and made me more savvy and pumped up my confidence. I am sure I would have written stronger résumés, prepped better for the key interviews, handled myself more adroitly during discussions, certainly have negotiated better, and definitely would have been smarter about getting myself top dollar in salary and the best possible package of benefits. Unfortunately I never came across such a powerful and wonderful how-to book. I mean it—I feel the book is useful at whatever rung of the career ladder you’re on, just starting out or high up in full-throttle career. It is written clearly. Its organization is logical and its common sense is impressive. Its tips are practical and obviously based on the author’s rich experience—not just pipe dream stuff. His anecdotes drive key points home and his graphics help you to understand. His down-to-earth style keeps you reading. He covers so many possible eventualities. That is so important. What the book is all about is preparing you to best advantage, giving you the preparation to be at ease and make a good impression face to face, and not jumping at just any offer but holding out and impressing your interviewer with your self-assurance and firmness. All good stuff. You will quickly see why the author rose so high in his own career, from rookie young engineer to senior vice-president in a famous international corporation. He’s not hesitant in telling you that he learned much of what he knows from mentors along the way, in his corporation and outside it, and from his many readings of experts, and, what is so important and impressive, from his own varied and challenging experiences through the decades. Do make it a point to read about him on the back cover of his book! You will be impressed. What I like is that his whole book is based on his conviction that integrity and hard work and determination are the rocks on which a good career must be based. So many people take shortcuts and do bad things in their fight to claw ahead. That is short-sighted and ruinous. Do not do that. Take the honorable road all the way and apply the tested and realistic suggestions and tips that he lays out for you. Your success is guaranteed, in my opinion. Your whole idea should be to effectuate a win-win situation every time for yourself and your employer. As a result, a real plus is that what you will do is make many friends as you go along, not a string of enemies (some people make many of these along the way). What is life without friends? And when someday you finally say goodbye and retire, you will look back on a career of accomplishment with satisfaction and pride. What drove this important point home to me is the long list of personal acknowledgments he makes at the end of his book—people he worked with at every step up, in his assignments in the U.S. and other countries. I re-read that long list of names and all I could think was, “How impressive!” I am one of those people that he thanks, by the way. The truth is it has been a pleasure for me to know Artie Lynnworth and be associated with him. Yes, I have lent him a small hand. But the truth is that I have learned so much from him! And still am! One thing I should mention is that I have bought extra copies of his book. Why? Because it’s so good! I intend to give them to young people I am watching who are on the way up and that I like. What nicer thing can I do for them? And what better way could I have of showing how highly I think of the author and this book of his. He has created for us a genuine keeper. It will help you immediately. And you will refer to it time and again. John Guy LaPlante Author of “Around the World at 75. Alone, Dammit!” and “Around Asia in 80 Days. Oops, 83!” and the forthcoming “My 27 Months in the Peace Corps. I tell you all!” See www.amazon.com or www.buybooksontheweb.com now for the first two and later for the third. What I like about this book...it's not a lot of things to remember, it's about the kind of person you are and how you approach your professional career and job assignments...you get to know Art Lynnworth as a person, lending credibility to what he teaches...practical, not some consultant's or college professor's idea about how the world outta be, but about how life in corporate management is...read the 18th chapter first like I did, this is where it starts...easy read, can be read in three hours by slow readers; I read it one chapter a day...wished I had read it when I started my career. Personally, I have found this text an excellent reference for college students in several of my classes and recommend it to them as a "must read." I refer to many of these students as our new "lost generation"- due to the struggles they are dealing with and the responsibilities they put on themselves to succeed and find a good job once they graduate. The pressures they are under to market their new college education is also considerable, especially in these difficult economic times. Unfortunately, the college education system in general does not prepare them for the intense competiton they are facing in the job market unless they were already involved in occupational mentoring (also discussed in this text) or job internships while in school. Mr. Lynnworth's book offers unique ideas and suggestions as to improving upon resumes and job interviewing skills. It is also an excellent resource for job hunters who wish to improve on their own "human resources" and occupational abilities. Given the author's extensive work experience especially in company management, he is in the best position to give out this advice!!! I just completed the "Launch Your Career" workshop and I recommended "Slice the Salami - Tips for Life and Leadership" to all of my fellow classmates. I think one of the most encouraging things I did during my time off was to discover all of the “STARS” accomplishments I achieved through your STAR process. I believe everyone that has lost their job should examine their work history right away and document their accomplishments, not only to demonstrate their value to potential employers but to remind themselves of their own personal value and contributions. Great book!